Dumgoyne, 9 August 2010: Glengoyne is expanding its award-winning whisky portfolio with the launch of two new Limited Edition Single Cask Malts. The new 13 Years Old and 23 Years Old Glengoyne Highland Single Malts were handpicked by a team of experts at Glengoyne before being personally approved and signed by Distillery Manager, Robbie Hughes. The new limited editions are in response to growing demand from Glengoyne enthusiasts, curious to discover new expressions from the highly respected distillery. Both limited edition single malts bring their own unique characteristics to the Glengoyne range, enhancing its famed reputation as the Real Taste of Malt, untainted by peat smoke. Presented in a handcrafted dark wood presentation box, showcasing its deep amber colour, the 13 Years Old has a nose of ripe strawberry and banana, molasses, hazelnut and a hint of mint. The palate opens with spice, before liquorice, milk chocolate and toffee overtake, slowly moving around the tongue and pleasantly lingering with sherried flavours and nut oils. Displayed in a varnished oak case with copper plate, the 23 Years Old Single Malt has the appearance of old gold and a fresh nose of lemon sherbet and champit neeps, accompanied with oily, rich butter and freshly ground black pepper. The malt offers an elegant palate of crème brûlée with a grapefruit and custardy sweetness, before a long finish of burnt sugar and short crust pastry. 256 bottles of the 13 Years Old and 548 bottles of the 23 Years Old are available worldwide from select specialist whisky outlets. Recommended retail prices for these very limited bottles start at £120 for the 13 Years Old and £195 for the 23 Years Old, reflecting their rarity. Glengoyne is one of the leading premium malt whiskies in the world and has been distilled at Glengoyne distillery for over 175 years. Only the slowest distillation process, untainted by peat smoke, creates Glengoyne – THE REAL TASTE OF MALT. 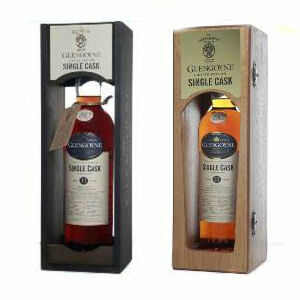 The new single casks join the award-winning core range, which includes the Glengoyne Single Malt 10 Years Old, 12 Years Old, a Cask Strength 12 Years Old, 17 Years Old, 21 Years Old and Vintage 1972.